Strength training (also called as weight or resistance training) involves engaging your muscles so as to resist against a stronger-than-normal counterforce. Examples are pushing against a wall or lifting weight or pulling on a resistance band. Increasing resistance or using progressively heavier weights activates and strengthens muscles. These types of exercises help gain muscle & bone mass, tone muscles and make bones stronger. They also help boost up the strength that you require in old age for day-to-day activities such as carrying groceries, getting out of car, climbing stairs, lifting your grand child or rising from a chair. The national health guidelines recommend for doing strength (weight/resistance) training exercises in order to work on all major muscle groups (chest, shoulders, arms, back, abdomen, legs and hips) at least two times in a week. Normally one set of 8 to 12 reps of the same movement per session is ok, though most fitness experts recommends that 2 to 3 sets provide better results. The muscles require at least forty-eight hours to recover between strength training sessions. Below are given 13 strength training safety tips, guidelines and instructions to help keep strength training exercises safe and effective as well. Warm Up & Cool Down: Before starting a strength training workout session, you should warm up for about 5 minutes. Walking is an easy and effective way to warm up. And when you finish a session, cool down your muscles. Stretching is a great way to cool down. Useful Related Post: How To Warm Up Before Workout? Use proper technique. Give more importance to correct form than weight. Do the exercise in slow, smooth movements. Incorrect form slows down gains & moreover can cause injuries. The fitness training experts recommend that the beginners should first practice a strength training routine either with no weight or with very light weight. Focus on slow, controlled lifts and likewise slow & smooth descents. Progress Gradually: In the beginning, you may be able lift a few pounds only. It’s ok. Soon your muscles, tendons & ligaments will get used to strength training exercises. If you keep on doing weight (strength) training regularly, you will surprised at how soon you progress. Once you can easily do 10-12 reps with a certain weight, increase the weight gradually. Breathing: Don’t hold your breath. The thumb rule is to exhale (breath out) during the harder or exertion phase (when you work against resistance by lifting, pulling or pushing) and inhale (breath in) during the easier or relaxation phase. Workout at the right tempo to maintain control rather than compromise strength gains through momentum. For example, count to three while lowering a weight, hold, and then count to three while raising it to the starting position. Maintain Correct Form: All through the movement, focus on maintaining correct posture & body positioning (form) because when you use incorrect form, wrong posture or poor technique, the risk of injuries increases. Always choose weights according to your own capabilities. Reduce the weight or stop if you feel the weight is too heavy or getting out of control. Selection & Progression Of Weight:The right weight for you depends on your fitness & strength levels plus the specific exercise that you are going to do. Select a weight that tires out the targeted muscles by the last 2-3 reps, but yet allow you to sustain good form. If you are unable to do the last 2-3 repetitions, go for a lighter weight. 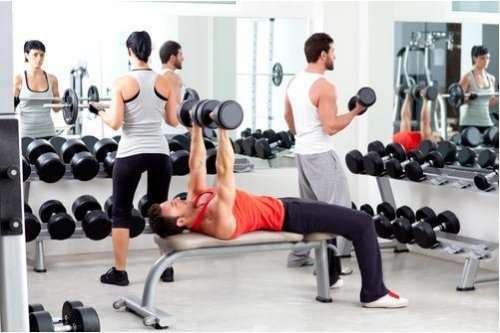 On the other hand if it feels too easy to complete all the reps then add weight (about one to two pounds for arms, two to five pounds for legs), alternatively increase the number of reps or add one more set of reps (up to three sets in total) to your workout session. When you increase weight, make sure that you are able to complete all the reps in good form and the targeted muscles should feel tired by the last 2-3 reps. Use this technique to keep challenging muscles by gradually increasing weight or resistance. Good Control: Don’t use momentum to swing at any time through the entire range of motion. The movements should always be smooth without any jerks. Recovery Time: Strength /weight/ resistance training leads to teeny tears in muscle tissues. These tears don’t harm. Muscles gain strength as the tears knit up. A good thumb rule is to allow your muscles minimum 48 hours to repair before working the same muscle group again in the next strength training session. Don’t Over Do: Work on all the major muscles of your body 2 or 3 times in a week. You can either do one full-body strength workout 2 or 3 times per week, or you may divide your strength training workout routine into lower & upper body components. In later case, make sure you perform each component 2 or 3 times in a week. I prefer to do one body part in a day: Chest (Monday), Back (Tuesday), Biceps (Wednesday), Shoulders (Thursday), Triceps (Friday) & Legs (Saturday) and rest on Sunday. You may change the order. Full Range Of Motion: It is important that you try to complete full range of motion of the joint slowly when doing a strength training exercise. This will build strength of the targeted muscle/joint at each point of the motion & minimizes the risk of injury due to over-stretching. Strength/Resistance/Weight Training For Beginners & Seniors: Check with your doctor before you begin any new exercise program, especially if you are beginner, aged over 40, overweight, haven’t exercised for long time or if have a pre-existing medical condition. Also you can talk to a fitness professional and seek his help to develop a safe, effective strength-training program for you. Don’t Throw Or Drop Weight: Once you have completed a set, place the weights on the floor gently. Don’t drop them as you might injure yourself or even people nearby. (i) While lifting keep your back straight and make sure to use your thighs when picking up or lifting weights from the floor. (ii) Train with a partner. Especially when using heavier weights have somebody present to ‘spot’ you (take the weight from you when you can’t hold it any more).